Visual impairment occurs when a person has sight loss that cannot be fully corrected by wearing glasses or contact lenses. The term covers a number of conditions, including Glaucoma, Macular Degeneration and Cataracts, along with more general problems of low vision, which can be associated with the ageing process. Glaucoma – a condition of increased pressure within the eyeball, causing gradual loss of sight. Age-Related Macular Degeneration (AMD) – an eye condition and a leading cause of vision loss among people age 50 and older. It causes damage to the macula, a small spot near the centre of the retina and the part of the eye needed for sharp, central vision, which lets us see objects that are straight ahead. The likelihood of having eye health conditions increases with age, and the older age profile in Devon contributes to higher prevalence rates locally. The most common condition is cataracts, which affect around 23,100 people in Devon or just over 3% of the total population. Around 18,600 people are defined as having impaired vision (poor visual acuity and/or reduced field of vision); of which around 2,900 are severely impaired where a person is so impaired they cannot do any work for which eyesight is essential. Population ageing and growth have a major impact on the prevalence of these conditions in the population, and their rate of increase, with an increase of around 11 to 14% in visual impairment and associated conditions expected in Devon over the next five years. 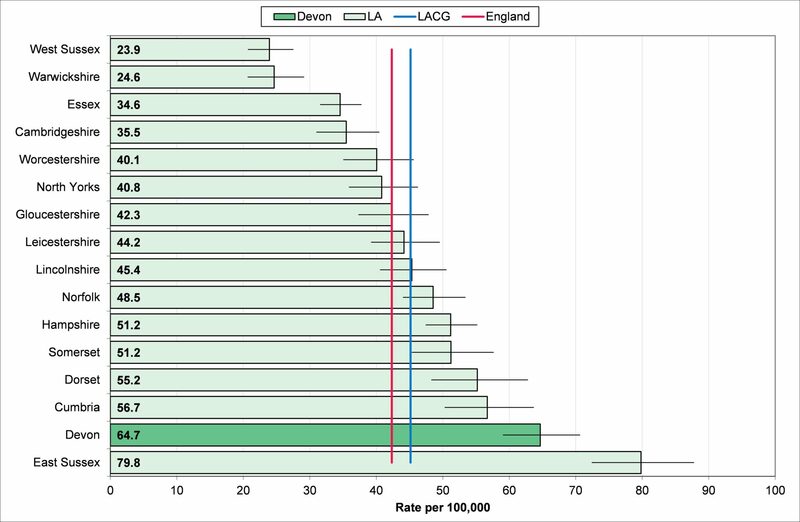 Prevalence rates for visual impairment and associated conditions vary by local authority in Devon, with the lowest percentage prevalence in areas with a younger age profile, such as Exeter and Torridge, and the highest rates seen in East Devon and Teignbridge. Table 10.5 sets out current estimated prevalence for Glaucoma, Age Related Macular Degeneration, Cataracts and Impaired Vision by local authority district. 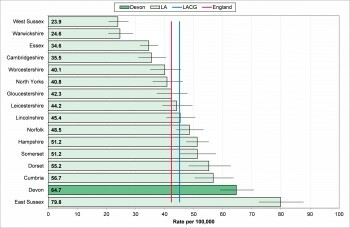 Sight loss certifications per 100,000 population are measured in the Public Health Outcomes Framework, revealing higher levels of sight loss certifications than the national and comparator group rates in Devon. Three further indicators appear in the Public Health Outcomes Framework relate to the three main eye diseases, which can result in blindness or partial sight if not diagnosed and treated in time. These are age related macular degeneration (AMD), glaucoma and diabetic retinopathy. These indicators relate to sight loss registrations as a result of these three conditions in particular age groups. Table 10.6 highlights higher levels of registrations in Devon for these conditions compared with England. The counts include sight loss due to these conditions as the main cause or if no main cause as a contributory cause, which could result in individuals being counted again under other conditions if more than one contributory cause. Certification is voluntary so true rates may be higher than this analysis shows. As such it is unclear whether differences are due to incidence or data collection levels, so it is not possible to conclude if these differences are due to greater risk in Devon or improved detection and recording. Incidence may vary due to the risk of sight loss being influenced by health inequalities, including ethnic, deprivation and age profiles of the local population. There are also geographic variations in data collection; in some instances completion of additional examinations required to complete the certification are incentivised. Due to this data collection levels may reflect non-completion of certification rather than just low incidence. These limitations relate to all four eye health measures in the Public Health Outcomes Framework. An Eye Health Needs Assessment is currently underway in Devon and will be completed during 2015-16, which will explore these issues in much greater detail.